Although we might still have the one or the other postlude, our “Klebergate” seems to have come to an end. As is of common knowledge by now, Kleber’s agent Giuseppe Dioguardi made a huge mistake in throwing his client head to head against Palmeiras in the belief that Kleber would either get a substantial salary raise (on top of the US$ 230.000 a month he’s currently making) or be in a position to accept a transfer to Flamengo for a bigger pay check; in either case Dioguardi would make a nice little profit for himself. No such luck, as Dioguardi didn’t pay enough attention to Kleber’s contract, which stipulates not a US$ 4 million but rather a US$ 88 million fine in case of a contract break with Palmeiras. When Dioguardi perceived he had brought less than a knife to a gunfight, he had Kleber publicly attack Palmeiras’ director of football Frizzo and president Tirone. By calling Frizzo a incompetent coward without character, the aim was to create enough animosity for Palmeiras to happily agree to get rid of the troublemaker. Frizzo counter-attacked masterfully, calling Kleber a good boy and affirming that he trusted Kleber – in Frizzo’s words a competent and brave gladiator who knows the value of keeping one’s word – to honour his contract with Palmeiras. When Flamengo the other day “officially announced” that Kleber no longer was seen as an option, the curtains were closed and the lights shut down on this sad spectacle. Kleber has since returned to training, mumbling something about “playing as soon as he’s fit again”, which should be any day soon. Kleber is on a contract until mid 2015. I wouldn’t count on a salary raise this year if I was him, but rather a fine for dodging play (against Santos). If Palmeiras do well this and coming years, i.e. win some titles, then “salary raise” and “Kleber” might get mentioned in the same sentence again. Summing things up: Dioguardi and Kleber came out as major losers. Frizzo significantly boosted his popularity and strengthened his position for next year’s presidential race. And a very large majority of Palmeiras supporters, for whom Kleber was perhaps not an idol but certainly one of the more admired players in the squad, feel cheated. After all, the “Gladiator miniature” was launched only months ago, with Kleber telling us how much he loves Palmeiras and that this is the club where he’ll end his career. One lesson to draw is obvious: people are people and money corrupts. An idol is not cast every day, nor does it take a few years to become one. Kleber hopefully learnt not to blindly trust people around him. And that what takes years to construct can be destroyed in a foolish (or greedy) moment. 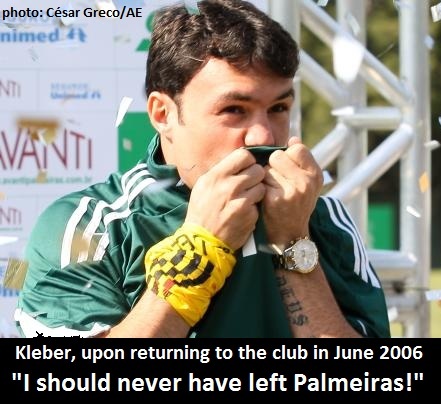 I’ll finish off with the words of Verdazzo’s Conrado Cacace: we can only hope that Kleber has the intelligence to never again, NEVER AGAIN, kiss the Palmeiras badge. Not Kleber, not anyone. Except for Marcos. Yeah, Leandro. I think too he should have thought about all he risked loosing (respect, being an idol and all that) before bitching about 380.000 reais being too little and that Flamengo would propel him to above 500.000. I’m glad he was put back in his place. He has a contract. Honour it! That’s some tough love. I’ll gaurantee he smooches that badge as soon as he scores, especially if it is a momentous goal. Rafa, you know what? I think it might take a while. He’s proud, this one. I think he’ll be a sour grape for quite some time.